The new Olympus PEN E-PM1 , known as the "Mini" is exactly that. It's smaller than what I used to call a compact camera, such as the Canon G11. Yet, the Mini sports a 3" LCD, shoots at 5 fps, has an AP2 accessory port, captures 1080p video with stereo sound, and records 12 MP Raw or Jpeg files. Plus, it accepts interchangeable lenses. The focusing on the current PENs is wickedly fast. And to be honest with you, I don't mind the streamlined look with a minimum of dials and buttons. In part this works for me because Olympus improved the menu system. It's actually easy to use. I'm going to be putting the PEN Mini through its paces over the coming weeks. I'll certainly have more to report. But for starters, I wanted to show you just how darn petite this beauty is. 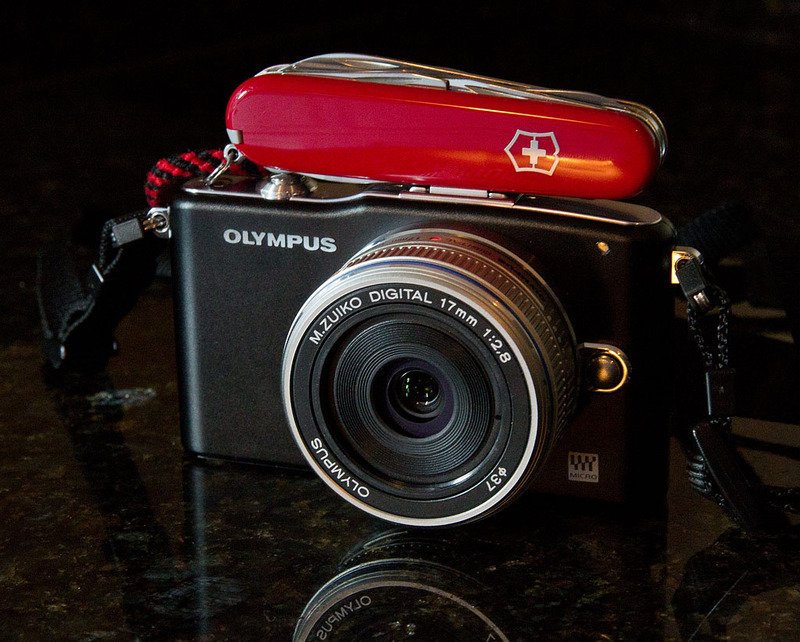 Street price for the Olympus PEN Mini with 14-42mm zoom is $499 US .